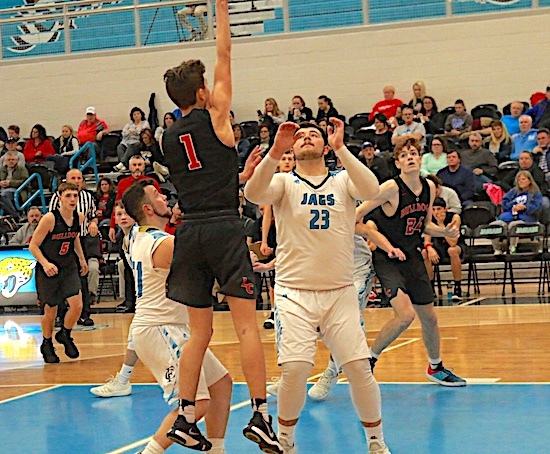 LANGLEY, KY. — After a lackluster first half Lawrence Co. ( 17-7 ) picked up the intensity and came away with a 53-50 victory Friday over Floyd Central ( 3-20 ) to clinch the #1 seed in the upcoming 58th District Tournament which will be held in Louisa. The Dawgs scored only 8 points in the first quarter and trailed 24-18 at halftime after Floyd Central hit a half court shot as time expired to end the first half. Lawrence Co. got things going in the third quarter and out scored the Jaguars 15-6 to take a three point lead into the final stanza. CJ Fairchild nailed two clutch free throws in a win over Floyd Central. In the fourth the Bulldogs kept the pressure on and kept the Jaguars at bay. CJ Fairchild hit 2 free throws with under 5 seconds left before a desperation three pointer by Floyd Central was unsuccessful. Lawrence Co. hit 4 three pointers and went 9-15 from the line. Floyd Central hit 3 three pointers and went 4-8 from the line. The Dawgs made the trek to face the Red Devils and came up short after a valiant effort. 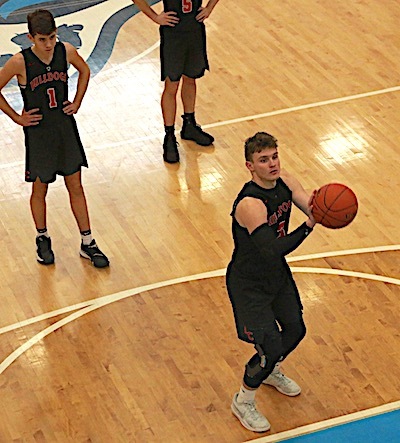 Tyler Maynard hit 5 threes for 25 points to lead four Dawgs in double figures, Cody Maynard netted 20 points, Noah Fairchild tallied 11 points, Chase Sartin 10 points, Alex Ratliff 3 points and CJ Fairchild 2 points. Lawrence Co. hit 8 three pointers and went 8-10 from the line. Russell hit 5 three pointers and went 21-29 from the line. The Dawgs will play three road games this week beginning with Sheldon Clark Tonight. Johnson Central Thursday and Paris on Saturday at 3:00.